Many families and individuals in California and across America who are struggling with credit card and other unsecured debts, such as medical bills and utilities, may be considering bankruptcy. 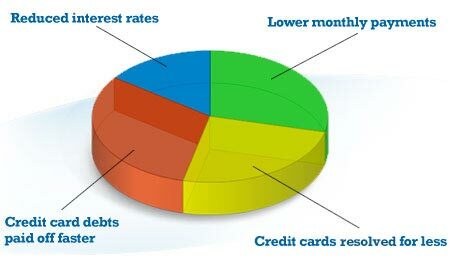 If unmanageable credit card debt is a part of your life, a stressful situation that you may desperately want to resolve, you may be wondering about bankruptcy – how it works, the different types of bankruptcy, and how it can potentially give you a new financial lease on life. Bankruptcy may be a good option for some consumers, but before making a serious decision that can have long-lasting financial implications, make sure you explore all of your debt relief options – including credit counseling, debt consolidation, debt management, or even debt settlement or debt negotiation. Debt consolidation through a credit counseling agency typically involves combining your high-interest credit card and unsecured debts – such as utilities or medical bills –into a single monthly payment that is easier to manage, more affordable and predictable. This type of debt consolidation program may also be called credit counseling or a debt management plan (DMP). Another debt relief option is debt settlement, which may allow consumers to settle their credit card debts for significantly less than the full amount owed. Both debt consolidation and debt settlement have become increasingly popular debt relief options as alternatives to personal bankruptcy, which can have a more severe, longer lasting effect on personal credit. To learn more about bankruptcy and other available debt relief options, take a moment to answer some simple questions to get a free debt relief savings estimate. Start here. Bankruptcy is a legal process whereby qualified individuals and businesses have the opportunity to have their debts discharged. If an individual can prove eligibility, a bankruptcy court will protect them from creditors during bankruptcy proceedings. This debt relief option is intended as a last resort for individuals and businesses who are experiencing a genuine financial hardship and want to make a new beginning in order to get their finances and life on track. A straight bankruptcy can typically remove your financial obligation to pay most of your credit cards and other unsecured debts. It can also afford relief from foreclosure. One of the most commonly asked questions about bankruptcy in California is whether or not financial obligations such as alimony, divorce payments, child support, or student loans are excused. These debts are not usually covered by bankruptcy. There are three main types of bankruptcy: Chapter 7, Chapter 11, and Chapter 13. Chapter 7 is also what's known as straight or total bankruptcy, or liquidation. Under Chapter 7, a consumer will typically have to surrender all property. While some property will be immune from this rule (termed exemptions, i.e. homestead exemptions), exemption laws vary by state, therefore it is important to consult California laws to clarity which types of property are affected. Also, since bankruptcy is such a serious financial consideration, it's wise to consult with an attorney or financial advisor before choosing the best course of action. Chapter 11 bankruptcy is commonly referred to as reorganized bankruptcy. According to the United States Federal Courts, this type of bankruptcy is most frequently used by a company or organization that is facing financial hardship, but wants to remain in business. Under Chapter 11, it can continue to operate, but it must pay its creditors according to a court-created debt reorganization plan. Lastly, Chapter 13 bankruptcy is a debt adjustment, not a form of bankruptcy that thoroughly eliminates debts. An individual would likely file for this type of bankruptcy if they desire legal relief from debts and are also willing and able to follow a formal debt payment plan based on their current income. Bankruptcy is a form of relief that can clear debts in situations where an individual is truly at the end of their ropes and can no longer meet their financial obligations. However, it is an option that has severe financial and legal implications and it is the option that has the most detrimental impact on personal credit, so it should be considered carefully before pursuing it. Some of the most popular forms of debt relief typically include debt consolidation or credit counseling and debt settlement. The goal of a debt consolidation program is to combine, or "consolidate," an individual's multiple higher-interest cards and other unsecured debts into a single, more affordable payment each month. Typically, debt consolidation programs are coordinated by credit counselors who customize a debt management plan, or DMP, providing consumers with a more structured and more predictable path to get out of debt. Debt settlement is generally a negotiation process between the debtor and individual creditors. When you enter into a debt settlement program, the goal is to negotiate or settle with creditors for significantly less than what's owed. However, debt settlement has risks: With debt settlement, your credit rating will typically decline because this option involves falling behind on your payments to save up funds, over an extended period of time, that you can use to make a settlement offer. As you fall behind in making your payments, your credit score will likely go down, especially if you had good or excellent credit prior to the debt settlement process. Also, many consumers enrolling in a debt settlement program may face legal action for defaulting on the terms of their credit card agreements. But in spite of the risks, debt settlement is still a popular alternative for many consumers seeking to resolve their debts. 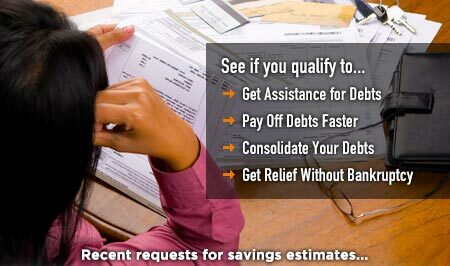 Is Debt Relief the Right Option for You? Whether it's in the form of debt consolidation through credit counseling or debt settlement, you should compare and contrast all of your debt relief options in order to make an informed decision about what's right for you and your family. To see your debt relief options and see how much you can save, simply answer a few questions and get your free debt relief analysis and savings estimate.